Elizabeth Warren took on Donald Trump on Tuesday night in a fiery speech that centered on Trump's past openness to a downturn in the real-estate market. 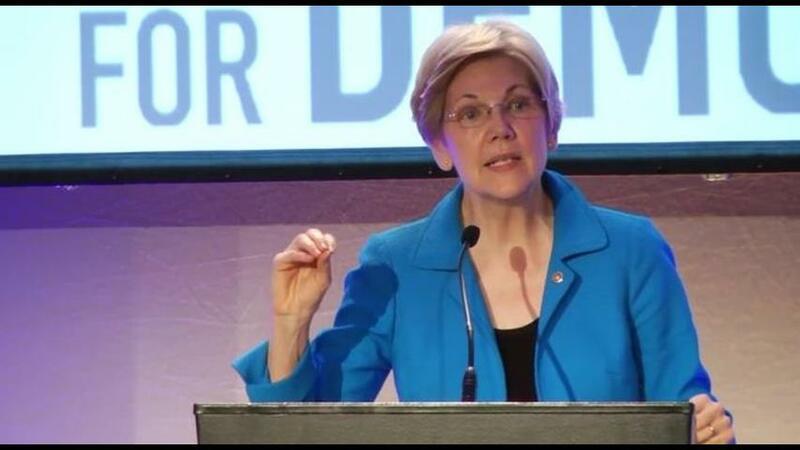 In a speech at the Center for Popular Democracy's annual gala in Washington, Warren slammed the presumptive Republican presidential nominee over comments from 2006, when Trump said he was "excited" for a potential market downturn so he could buy real estate at a lower cost. "What kind of a man roots for people to get thrown out of their house?" the Democratic senator from Massachusetts said. "What kind of a man roots for people to get thrown out of their jobs?" To root for people to lose their pensions, to root for two little girls in Clark County Nevada to end up living out of a van — what kind of a man does that? I'll tell you exactly what kind of a man does that. It's a man who cares only about himself. A small, insecure money-grubber who doesn't care who gets hurt as long as he makes a profit. Warren also criticized Trump's promise to repeal the financial regulations implemented under the 2010 Dodd-Frank Wall Street reform bill, questioning whether the real-estate magnate "could even name three things about Dodd-Frank." "Donald Trump is worried about poor little Wall Street," Warren said. "Let me find the world's smallest violin to play a sad, sad, song." She added that Trump was "kissing the fannies of the poor Wall Street bankers." Since unleashing on Trump in a series of Twitter battles earlier this year, Warren has emerged as one of the Democratic Party's most unrelenting and highest-profile Trump critics.
.@realDonaldTrump attacks vets like @SenJohnMcCain who were captured & puts our servicemembers at risk by cheerleading illegal torture. It will determine whether we move forward as one nation or splinter at the hands of one man's narcissism and divisiveness. At a commencement speech at Suffolk University on Saturday, the senator reminded students about Trump's high unfavorable rating among female voters. "How's this speech polling so far?" she asked. "Higher or lower than Donald Trump's unfavorable numbers with women?" Trump has fired back extensively, targeting Warren's heritage and what he called a lack of "guts" to run for president. Some observers have noted that Warren's pointed jabs at Trump demonstrate the senator's readiness to serve as a potential presidential running mate, a role that is often defined by attacking the other party's nominee. But not all Democrats are thrilled with that prospect. In an interview earlier this week, Democrat Harry Reid, the Senate minority leader, said he would "yell and scream" to stop Warren's nomination — or the nomination of any other senator from a state in which a Republican governor would make an appointment to fill the vacancy.